We’d love your help. Let us know what’s wrong with this preview of 風之谷 4 by Hayao Miyazaki. To ask other readers questions about 風之谷 4, please sign up. A complex story with no easy answers, well partnered with complex art and well developed characters. I really fell in love with Nausicaa by the end... Not the dark, not the light, but ~right~, and doing the best she could for everyone. This manga is respect worthy and beautiful. There is typical fighting violence, I would say about PG13. Mostly it's swordfighting, though a baby Ohmu (A giant bug) is tortured in one sad scene, and the story in general gets darker as things progres A complex story with no easy answers, well partnered with complex art and well developed characters. I really fell in love with Nausicaa by the end... Not the dark, not the light, but ~right~, and doing the best she could for everyone. This manga is respect worthy and beautiful. Work dragged me away from this, the only reason I didn't read the entire first volume (I had a four-in-one of these) in a day. This is a wonderful story. I was almost in literal pain to come back and read it. Doroks have been weaponising the spores. Bad things happen. Nausicaä confounds her enemies, because she is ossum. I am loving this series! This volume had some particularly striking artwork; the scene where the God Warrior is being transported by air and you see its face and body melting in and out of the clouds is downright terrifying. it had another slow beginning, but as the story progressed, it snowballed and became highly addictive by the end. Aika vähän on lisättävää aiempien osien arvosteluihini. Tuulen laakson Nausicaä on seitsenosainen sarja, joka on saumaton kokonaisuus eli sen voisi aivan hyvin julkaista yhtenä liki 1000 sivuisena niteenä. Yksittäisten osien arviointi on sama kun arvioisi erikseen Taru sormusten herrasta kirjan kolmea erillistä osaa. Mahdotonsa, sanoisin. Tuulen laakson Nausicaä on sotaa, julmuutta, lentokohtauksia, vaeltavia eliomassoja, biologisia aseita, eettisiä ratkaisuja ja tämä kaikki esitetään lukijalle u Aika vähän on lisättävää aiempien osien arvosteluihini. Tuulen laakson Nausicaä on seitsenosainen sarja, joka on saumaton kokonaisuus eli sen voisi aivan hyvin julkaista yhtenä liki 1000 sivuisena niteenä. Yksittäisten osien arviointi on sama kun arvioisi erikseen Taru sormusten herrasta kirjan kolmea erillistä osaa. Mahdotonsa, sanoisin. We see clearly now the distinction between the movie and the manga. Everything that happened now doesn't take place in the movie at all and I enjoyed discovering this new part of the story. 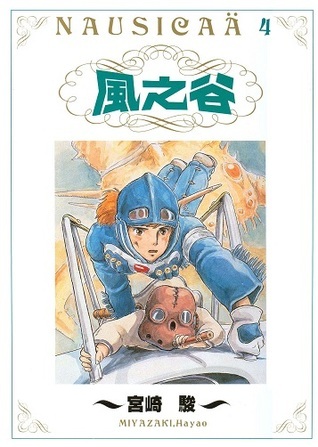 Nausicaä is still on of my favorite female character of all time and I love reading her story. I love the message of the entire series and it's something that is really close to my heart (I mean for exemple every one of my best friends know that if I could have a fictional pet I would definitely have a fox-squ We see clearly now the distinction between the movie and the manga. Everything that happened now doesn't take place in the movie at all and I enjoyed discovering this new part of the story. Upon just finishing the fourth installment of Hayao Miyazaki’s Nausicaa of the Valley of the Wind, I have to say I was very impressed with this installment. It added to the universe in which he had created and I enjoyed seeing the different characters on their journey throughout the story while building up to what I will presume to be the end of the series. The third installment was not my favorite because of the battles, which seems to take place over most of the book. Maybe I’m biased, but I a Upon just finishing the fourth installment of Hayao Miyazaki’s Nausicaa of the Valley of the Wind, I have to say I was very impressed with this installment. It added to the universe in which he had created and I enjoyed seeing the different characters on their journey throughout the story while building up to what I will presume to be the end of the series. Nausicaa is coming across more people and seeing even more what war does, and learning more about the forest and insects. The God Warrior comes into play a bit here, and I love how she is able to turn her foes to her side, if she is given half a chance. The forest being used for bio- warfare is quite interesting as well, as it is relevant even today, with worries about bio agents being used against people. This is a great series, that I am sad to have to stop here, since my library and county do Nausicaa is coming across more people and seeing even more what war does, and learning more about the forest and insects. The God Warrior comes into play a bit here, and I love how she is able to turn her foes to her side, if she is given half a chance. The tension is building as the various subplots cross each other, and we learn more about the Doroks and their plan with the spores and insects. Absolutley explosive action with a super intense ending. This series gets more interesting the deeper into the lore we get! This review has been hidden because it contains spoilers. To view it, click here. Ah non maudit fungus !! ;___; la tension est à son comble ! Continues to both grow and maintain being a great story. In order to live, you must be willing to die. Even the writer and artist of the manga gets it, this is a timeless story. This volume felt a little more disparate than many of the others. Still great! I cannot wait to watch the movie! Volume four & final book in the set. Personal choices abound and coping with life as it comes at you. I love this set of books. The maps and posters in each of these volumes are really nice. After reading this, I'm more impressed than I already was with Miyazaki, and that's saying a lot. I've often vacillated between regret and relief that I didn't babble and gush with stars in my eyes when I met him at the North American premiere of "Laputa" as a teenager (some years before he sold the English-language rights to Disney). All I did was shake his hand and thank him for his great work. My respect and admiration have only grown since then. By this volume, the story is far more complicat After reading this, I'm more impressed than I already was with Miyazaki, and that's saying a lot. I've often vacillated between regret and relief that I didn't babble and gush with stars in my eyes when I met him at the North American premiere of "Laputa" as a teenager (some years before he sold the English-language rights to Disney). All I did was shake his hand and thank him for his great work. My respect and admiration have only grown since then. By this volume, the story is far more complicated and involved than what was included in the film, which was released years before the pages included in this book. At this point, the story is split between four groups of characters: Nausicaä, having left the battlefront after arranging the release of Dorok captives back to the Torumekian army; Choruka, the Torumekian priest whose path keeps intersecting Nausicaä's; Kushana, Torumekian princess who is trying to save her troops; and Lord Yupa, the border lands' finest swordsman delving deep into the poison forests to investigate the possibility of another Daikaisho. Each of the four plots is detailed and filled with complicated motivations. Miyazaki definitely understands the benefits of the comics medium in being able to give a lot of information efficiently; writing what happens just in this volume only in prose might fill two or three novels, rather than the mere 134 pages here. Nausicaa departs from the besieged town and heads south to find the answers to the mystery of the southern forest. Kushana and Kurotowa leave on a mission of their own - to steal ships to rescue her besieged Third Army. Yupa and company travel through the forest and meet with the crew of the gunship. A massive migration of insects has begun, drawn south by the artificial spores created by the Dorok scientists, possibly triggering a catastrophic extension of the miasmic forest called the daikasho Nausicaa departs from the besieged town and heads south to find the answers to the mystery of the southern forest. Kushana and Kurotowa leave on a mission of their own - to steal ships to rescue her besieged Third Army. Yupa and company travel through the forest and meet with the crew of the gunship. A massive migration of insects has begun, drawn south by the artificial spores created by the Dorok scientists, possibly triggering a catastrophic extension of the miasmic forest called the daikasho. So far, it's great. The art is detailed, though a little hard to get into at first. The story is deep and epic, with complex situations with no easy answers. It's exciting to see each new problem and revelation as they come, despite the pain each might cause. Some moments are heart wrenching, and it's easy to really feel for Nausicaa and hold the same 'save everyone' desire she does. This is, in fact, a little bit of a downer so far because of that very wish; it seems impossible to save everyone So far, it's great. The art is detailed, though a little hard to get into at first. The story is deep and epic, with complex situations with no easy answers. It's exciting to see each new problem and revelation as they come, despite the pain each might cause. Some moments are heart wrenching, and it's easy to really feel for Nausicaa and hold the same 'save everyone' desire she does. This is, in fact, a little bit of a downer so far because of that very wish; it seems impossible to save everyone as of now. (And the baby Ohmu... ;__; Still not over that.) All the same, this is inspiring, and makes you think of how you really would react to these difficult situations. There is fighting, none of it really gory. Nothing of a sexual nature, and I cannot think of any language. Spoiler: A gigantic baby insect, heavily personified, is tortured to death to lure the others of its kind into a rage in an attempt to control them. The end of the series, at least from this publisher. I found it very enlightening, and brings up good questions about humans and the environment, and repercussions for our actions. It also made me wonder about life and what is life, and free will, and what kind of path is best when life is on the brink of despair and devastation. There are some new characters introduced in this book, which makes it a bit hard to keep track of them. There were a few sad moments, as well. El mejor de los 4 tomos que llevo leídos. Igual es que ya me he acostumbrado pero ya no he tenido esa sensación de desorientación y confusión. Y lo mejor de todo es que hacia el final del cómic es un no parar. Es imposible apartar los ojos hasta llegar al final y dudo que tarde mucho en coger el próximo, si es que no lo hago inmediatamente. Vale la pena leerlo. Kinda want this series to wrap it up. They go a little too slowly for my taste. But I'm not ready to pack it in yet, I want to see how it ends. This volume covered more battles between the different peoples and a new spore mutation that's threatening to spread into the villages.